After a three month hiatus, I’ve decided to return to blogging about food and our farm. It was impossible for me to juggle all the demands of the summer and have anything left to think coherently, much less write. We are just starting to turn the corner on the most intense part of our year, so now was a good time to recommit to posting on the blog. When I returned home from market on Friday and unloaded the van, I went into the barn to find every available surface covered with tomatoes. I went about pulling and packing for the following market day. I started sorting tomatoes and tossing the fruit that has ‘gone south’ and can’t be used into a wheelbarrow. This gets divided between our chickens and our compost pile. The tomatoes that are merely bruised or damaged in some way I put to the side. Last year I used some of these and made a fantastic roasted heirloom vodka sauce. This year is different. Our tomato yield had quadrupled due to using a new guide-wire system, creating a larger percentage of usable ‘seconds’. By the time I was finished sorting for Saturday, I had a two whole tub of heirlooms. It was time to roast them in batches with a few adjustments and can them for winter. No such thing as a wasted heirloom. Here they are ready for the oven. I brought them all into the kitchen. I got out my roasting pan and decided it would hold at least half of them at one time. With Val’s help we proceeded to cut out the spots, imperfections and bruises, then cut them up in manageable pieces. We seeded them by holding each topped tomato in our palm, then giving them a slight twist, turning them 20 degrees and repeating this twist. Most of the seeds and jelly will fall out. You don’t need to be a perfectionist about this process. Coring, seeding and chopping went pretty fast and we had the whole roasting pan filled in about half an hour. I set the oven at 325, drizzled them with olive oil, then sprinkled them with salt. I added 1 head of garlic, peeled and chopped, 1 tablespoon each of salt, dried basil and oregano. In they went. I set the timer for one hour later. When the timer went off I opened the oven to give it a stir, and removed the first 4 cups of liquid from the pan with a ladle. This would be repeated twice more for a total roasting time of four hours. The whole house started smelling like a kitchen in Italy. I had 4 pints of pulpy seasoned broth I would water-bath and use for soups or risotto’s, and half a roasting pan of the most beautiful condensed roasted sauce you could imagine. Two batches of this roasted sauce yields approximately 5-7 quarts of sauce that can be frozen or water-bathed for 15 minutes. The uses for this sauce are limited only by your imagination. 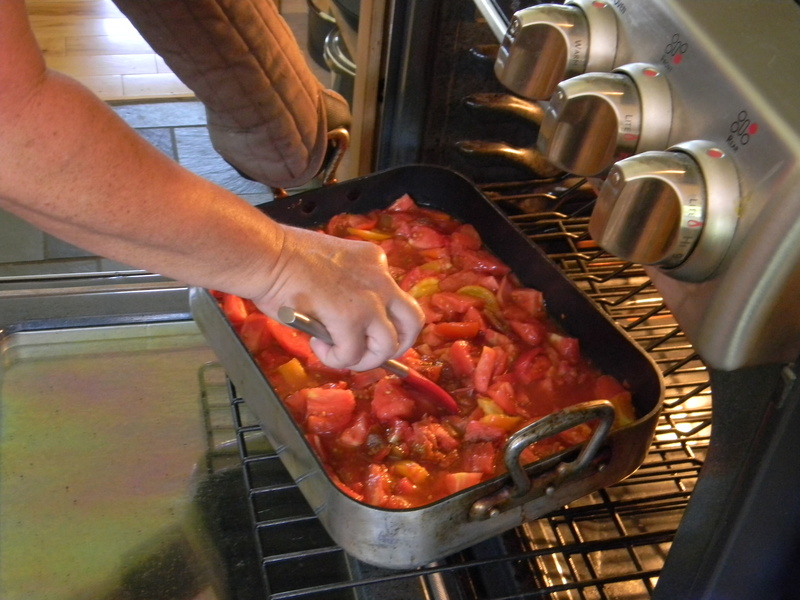 Add vegetables, turn it into a pizza sauce with a quick turn in the food processor or make lasagna. 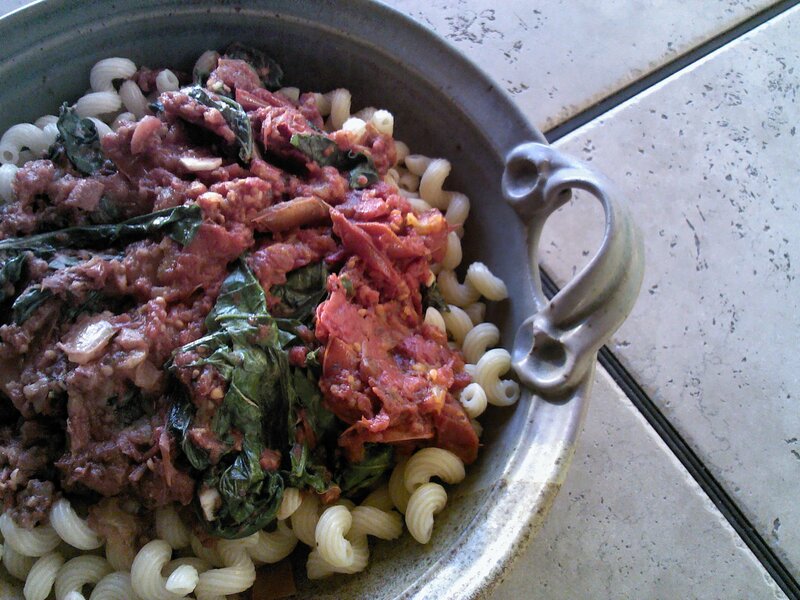 Tonight I added fresh arugula and poured it over cavatappi pasta. You can also grill assorted veggies like eggplant, zucchini, summer squash, red or yellow sweet bell peppers and onions. You name it. 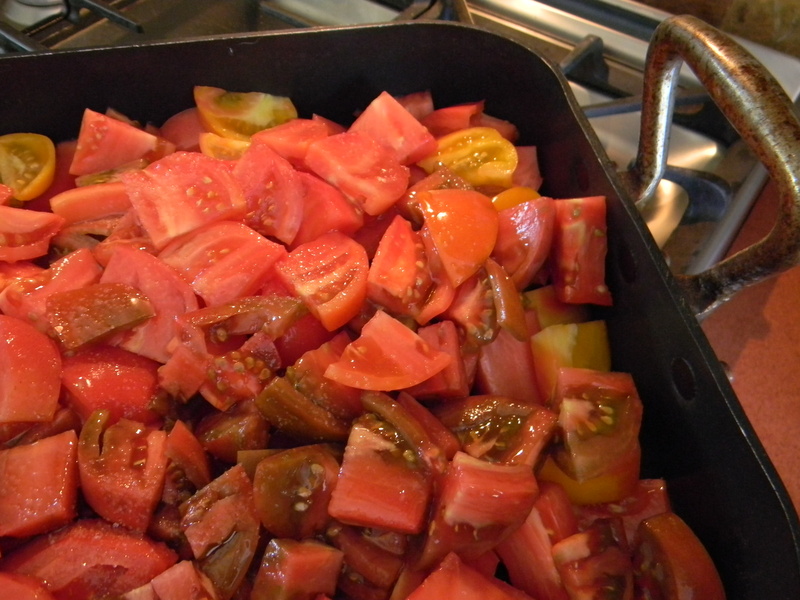 This entry was posted in Essays, Farm News, Food Issues, Recipes, Uncategorized, Vegetables and tagged brickyardfarms, compost pile, dinner, essays, farm, food, locavore, manageable pieces, rants, raves, recipes, tomato yield, tomatoes, vegetarian, vodka sauce. Bookmark the permalink. You will never use canned tomato sauce again after trying this sauce.This is how the italians make it and it is exceptional.I make this all summer and as far into the fall as I can find decent tomatoes.I highly recommend you use roma or italian tomatoes and discard the seeds as they are bitter. You’re right about this sauce; it’s the only way to go! It ends up deep, concentrated and luscious. I’ve missed your blog…glad you’re back! It’s good to be back Diane! Thanks so much for reading!